Don't leave, you are in the right spot! It's still Mrs. Miner's Monkey Business, it just looks a whole lot better (don't you think?) thanks to the fabulous designer, Alicia, at DreamLikeMagic. Not only does she offer fabulous blog templates, Alicia is absolutely wonderful to work with and is very fast. 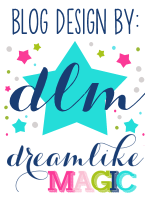 I just checked out ChalkTalk's new blog design yesterday and decided I would love a redo just as funky and fun, and, voila! here it is. The price couldn't be more worth it, but Alicia has so kindly offerred my fans a promo code if you decide to do a switcheroo on your blog, too! Head over to DreamLike Magic and, upon checkout, enter code monkey15 to save 15%! Thanks again to Chalk Talk and Alicia for helping me get my blog looking so monkey-licious today. Oh, I love the new design! That monkey is adorable..so are the polka-dots! Too much cuteness in one place!!! The new design is adorable - especially the monkey! Love the bright colors too! LOVE it!!! Absolutely adorable!!! I wish I could find one that went with my football theme. I love the monkey... Soooo cute! Alicia does a great job!